President’s Memo: Having Done All, Stand! His delinquency manifested itself in the form of theft. As a teen he would steal anything he could get his hands on. He was fast. Fortunately his brother, Pete, lured him into running for something instead of away from authority. He competed at the 1936 Olympics in Berlin, where Adolph Hitler took notice and personally complimented him on his speed. Two years later he set a national collegiate mile record which held for 15 years, earning him the nickname the “Torrance Tornado.” But Louis Zamperini’s real test of determination and resilience began when he joined the United States Army Air Force in 1941. His story is chronicled in Laura Hillenbrand’s best seller, Unbroken, A World War II Story of Survival, Resilience, and Redemption. Survived 47 days on a rubber raft in the Pacific Ocean after being shot down by the enemy. Spent two years in Japanese torture camps as a POW being singled out by the camp’s commander for beatings and mental and emotional abuses. Came home to a hero’s welcome and to severe depression leading to alcoholism. Turned his life around after attending a Billy Graham crusade and began touring the country as a motivational speaker. For his 81st birthday, in January 1998, Zamperini ran a leg in the Olympic Torch relay for the Winter Olympics in Nagano, Japan, the site of his earlier torture. At age 94 he currently lectures throughout the country, particularly at high schools, on the lessons of resilience and determination. The main reason I love the story of Louis Zamperini is that it reminds me of the toughness, the durability and the resilience of the human spirit. And while we may not have experienced Zamperini’s particular challenges of will, we nonetheless face our own tests of determination, toughness and survival. Whether it’s disease, loss of cherished friends or family, grave disappointment, personal attack, business set-back, reputational damage or a host of other encroachments on our emotions and willingness to carry on, we have encountered and will continue to face decision points of determination when we are called upon to stand firm against all odds. In my 17 years with NASBA I have witnessed on a number of occasions belittlement, scoffing, demeaning, diminishment of and outright threats (usually of a financial nature) against State Boards of Accountancy. Whether it’s a maniacal and wrongful use of public record access costing hundreds of thousands of dollars, lawsuits leveled at Board members, state officials reducing already inadequate funding, untold pressure to bend to vested interests and other similar assaults on Boards or their members, Boards have exercised their indomitable spirit. It’s the same kind of spirit that makes any of us persevere in other grave situations. Do we give in? Give up? Retreat? To the contrary, we in the spirit of a Zamperini, stand firm, assert resilience and determination to do the right thing. That’s the heart of a public servant. That’s the spirit of State Boards of Accountancy. 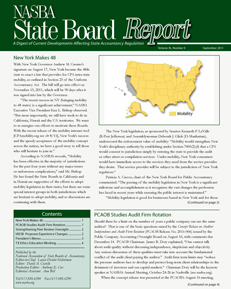 To be effective in serving the public interest, State Boards of Accountancy must be relevant – properly structured, staffed, organized, funded and working objectively to fulfill their mandate. Boards must maintain proactive relationships with the public, the profession, federal and international regulators and the education community. In our world of rapid communication, fastpaced technology and almost daily new editions of smart phones, Boards must be responsive. President's Memo: Can Regulation Keep Pace?